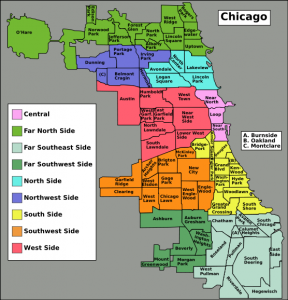 Chicago is made up of 77 community areas that are often grouped into nine districts or “sides”. The community areas are well defined and do not overlap. Each community area has one or more neighborhoods in it. The neighborhoods are often not well defined and over lap each other.Below is list of districts, community areas and neighborhoods. They are organized by district with the community area in bold followed by the neighborhoods in the community area in parenthesis. Thank you to The Chicago 77 for this information. If you are looking to buy or sell your home in any of these beautiful neighborhoods, contact the Move With Maggie Real Estate Team!